This is a popular Southern Indian recipe that is either served as a side dish to curries or on its own with mango pickle or chutney. Note the tradition of adding a thinly sliced chile to the rice. Channa dal is dried yellow chickpeas, available in Asian markets. Note: This recipe requires advance preparation. Preheat the oven to 250 degrees F. Drain the rice. Heat the vegetable oil in a casserole on top of the stove and add the mustard seeds and channa dal. As soon as the mustard seeds pop, add the onions, chile slices, and curry leaves. Fry until the onion is soft, and then add the turmeric powder. Pour in the water, bring to a boil, and add the lime juice and salt to taste. Mix in the drained rice, bring to a boil, lower the heat a little, and boil gently until the water evaporates to the level of the rice, about 5 minutes. Cover the casserole with a lid and transfer to the oven. Bake for 10 to 15 minutes. 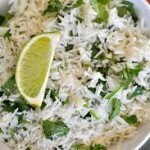 Serve the rice garnished with the cilantro, cashew nuts, and lime wedges.